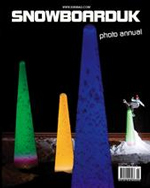 It's been a strange season with unusual conditions for Europe, and the season's final issue of Snowboard UK magazine is out - the annual photo edition. Inside get ready to gorge yourself on some of the best snowboarding shots of the year from around the world and of course read SnowSphere's final "A Line Less Ordinary" column of the season - this month looking at the snowboarding opportunities of Israel - the country that brought you the Uzi sub machine gun. It may be the last SUK for a few months - but they'll be back in the autumn, along with a new and expanded SnowSphere column, plus SnowSphere will be here all summer, continuing to bring you news, reviews, stories and features from the snowy peaks of our planet.